Port Blair, Sept. 12: Shri Vivek Rae, IAS (Retd.) Chairperson and other members of the Committee constituted by NITI Aayog, as envisaged by Islands Development Authority, to address the land and project related issues in Little Andaman and Great Nicobar called on Admiral D K Joshi, PVSM, AVSM, YSM, NM, VSM (Retd. 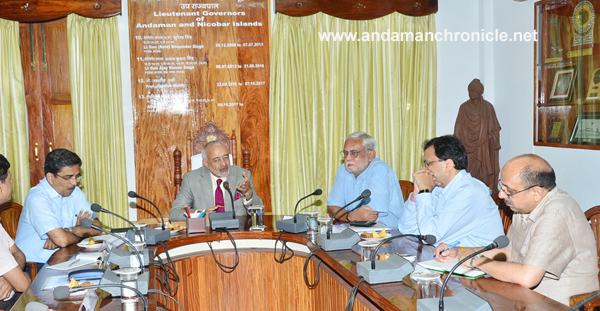 ), Hon’ble Lt Governor of Andaman and Nicobar Islands & Vice-Chairman Islands Development Agency today at Raj Niwas. Matters related to holistic development of Identified Islands were discussed. ACCI was also represented by Mr. Girish Arora & Mr. Mohammad H Jadwet.